MacKenzie Commercial Real Estate Services, LLC is pleased to announce the Board of Certification/Accreditation (BOC), an independent, not-for-profit agency offering highly valued credentials for medical professionals and suppliers, has signed a lease for 5,200 square feet at BECO Tower Two, 10461 Mill Run Circle, Owings Mills, Maryland. MacKenzie Senior Vice President Karen Deeley represented BOC in the transaction. 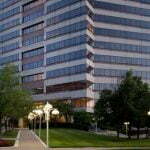 The building is one of two iconic, Class A office towers owned and managed by BECO Management in the Owings Mills market, an area ripe for opportunity with the future redevelopment plans for the neighboring mall site underway and the successful Foundry Row and Metro Centre projects nearby. Founded in 1984 to provide certification for orthotic and prosthetic (O&P) professionals, today BOC offers credentials including accreditation for O&P practices, pharmacies and durable medical equipment (DME) suppliers, and certifications for O&P and DME professionals. Over the course of the past seven years, the organization has experienced significant growth in both revenue and staffing through the addition of two new credentialing programs and the establishment of an inside business development team, an unconventional decision for a nonprofit that has yielded significant results. Currently located next door in BECO Tower One in approximately 3,600 square feet, the new, larger space will better support BOC’s continued growth. While BOC’s impressive growth has meant much change, including the upcoming office move, leadership emphasizes the company’s commitment to stay true to its core organizational values is a constant. BOC’s customer-first approach has been recognized by the prestigious Stevie® Awards, the world’s premier business award created in 2002 to honor and generate public recognition of the achievements and positive contributions of organizations and working professionals worldwide. BOC has received seven Stevie® Awards in a five-year period for business development, customer service and innovation. For more information on BOC, please visit www.bocusa.org. For information on MacKenzie’s tenant representation services, please contact Karen Deeley at 410.494.4871 or kdeeley@mackenziecommercial.com.